Finding natural, healthy beauty products that are just as effective as standard beauty products can be a bit tricky. It definitely requires a bit of patience, research and experimentation but in the end I think it's totally worth it, especially for those who are sensitive to toxins. I love the process of mixing my own beauty products and my sons are always eager to help. I truly believe in holistic healing as it has been around for generations and I like to avoid chemicals like lauryl sulfates. Plus its nearly shamanistic, kind of makes me feel like a healer as oftentimes my natural concoctions actually work like magic :P. It even saves money in the long run. Thankfully there are quite a few natural stores that carry a ton of natural products at prices that usually beat Whole foods or other health food stores. 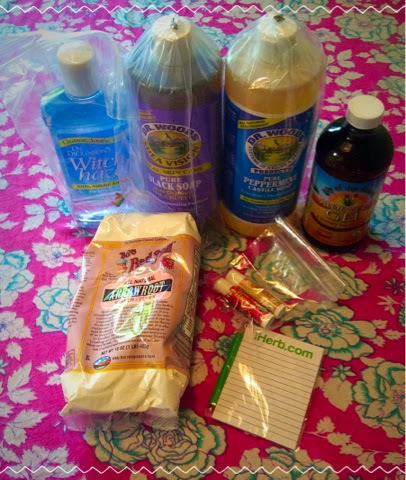 Lately I have been loving iHerb for my natural beauty supplies and ingredients. I buy quite a bit on Amazon too but iHerb has their prices beat for some of my beauty staples. iHerb also has free expedited 1-5 day shipping with a $20 purchase. Works for me! Favorite scents: black soap for body and hair, peppermint for feet and hands. Uses: body wash, shampoo, foaming hand soap. I love to mix with distiller water and put it in a foamer! Why I like it: the Shea butter versions are actually moisturizing which is rare for Castile soap. Cheaper than Dr. Bronner's. Black soap is great for clarifying pores. The peppermint is tingly. Why I like it: This particular aloe vera gel is cheap, free of additives and it doesn't smell weird. Must be refrigerated after opening. Why I like it: At $5 this is really cheap for 1 lb of arrowroot powder and it is good quality. Why I like it: These were on special for $0.50 each and for that price they are amazing! Great to know that it is pure and organic so that it is safe to consume and great for those who are sensitive to chemical fragrances. iHerb has a link to all of their specials at the top of the page. I almost always buy a special as it is a really great way to try a product at a discounted price. Like many other sites iHerb has a referral program. If you are new to iHerb you can get a discount for joining. If you follow my referral link http://www.iherb.com?rcode=JEL031 you can get $10 off your first purchase! If you are going to spend over $100 there is also a standard 10% off for new customers, but the $10 code is even better if you want a smaller order just to try it out. Thankfully I have never had any troubles with shipping. In my experience the free shipping method has always reached me within 3 days. iHerb packages their goods well too. I have not had any troubles with leaking but they package each item in an individual bag just in case any containers open which I appreciate. They often tape the lids of liquids and gels to keep them contained. What are your favorite natural beauty products?